Some sauropod dinosaurs in the Cretaceous period had a well-developed polygonal skin texture covering nearly the whole of their foot pads, as seen in modern elephants, which would increase stability when walking on the muddy and wet ground, according to a research paper. Skin impressions in dinosaur footprints have very rarely been observed, although Cretaceous fluvio -lacustrine deposits along the southern coast of the Korean peninsula contain many dinosaur tracks. 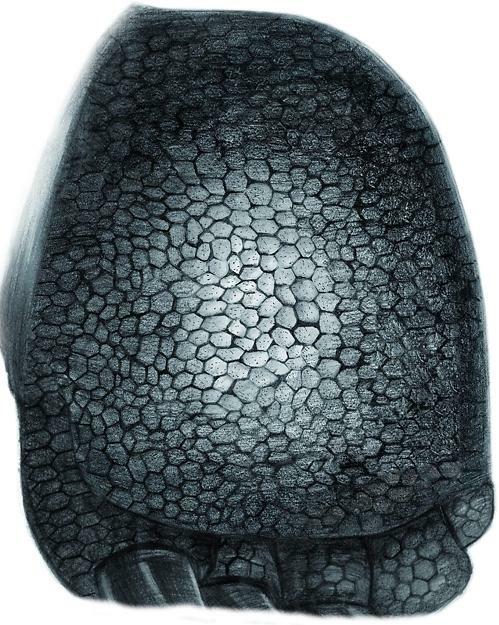 "The distinct skin impression and its cast observed in this study are the largest reported to date for a sauropod footprint,"
A large and distinctly preserved skin impression, 50 centimeters in diameter, on the cast of a footpad print of a sauropod dinosaur, has been discovered, along with some diffuse and partial skin impressions in other dinosaur footprints, said a team led by Paik In-sung, a professor at Pukyong National University's department of earth and environmental sciences in Busan. "The distinct skin impression and its cast observed in this study are the largest reported to date for a sauropod footprint," according to the team's research paper, presented at Scientific Reports, an online scientific journal. 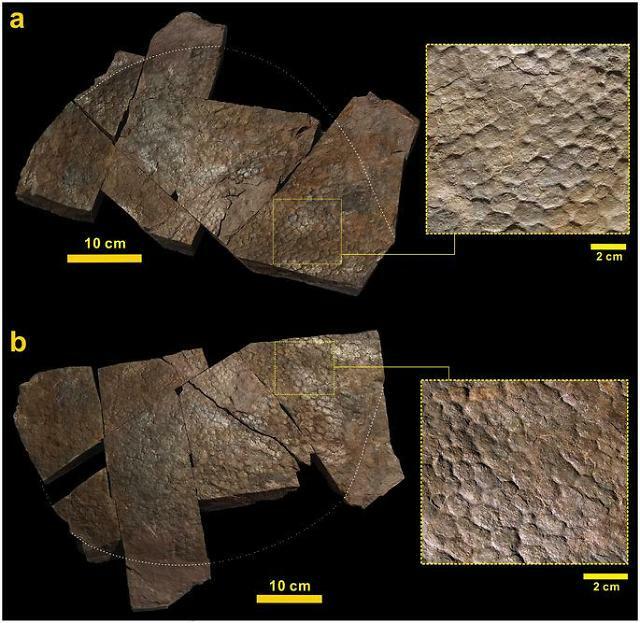 Paik's team suggested that dinosaurs would have adapted polygonal skin texture on their foot pads as they expanded their habitat into alluvial environments during the late Mesozoic. "The observations here suggest that some sauropod dinosaurs in the Cretaceous had a well-developed polygonal skin texture covering nearly the whole of their foot pads, as seen in modern elephants, which would increase stability when walking on (the) muddy and wet ground," it said. The distinct preservation of skin impressions in a dinosaur footprint was found from the Cretaceous period in Haman, 275 kilometers (170 miles) southeast of Seoul, which is not far away from Goseong, a southern seaside town well known for beach rocks embedded with hundreds of dinosaur footprints. A hypothetical theory was presented: "One day, a sauropod walked very slowly or stopped on a smooth and microbially active muddy surface a few millimeters thick overlying sand, forming a distinct imprint of the foot pad skin texture in the footprint. The skin impression-bearing surface dried out during the succeeding drought season, resulting in semi-consolidation of the skin impression. The footprint with the skin impression was flooded during the subsequent rainy season, burying the footprint and preserving the skin impression by sediment deposition." Paleoenvironmental conditions have been documented in many dinosaur track-bearing deposits around the world, but distinct skin impressions in footprints are extremely rare in these deposits, suggesting that most dinosaurs did not have a polygonal skin texture on their foot pads, the team said.